“Hi. I just wanted to say thank you for providing such a great atmosphere and fun time yesterday. The food and music were awesome. We really enjoyed the bagpipers and Irish dancers as well. And, also wanted you to know how attentive and friendly your bartenders are! What a gem!!! It’s like going to Ireland without the jet lag. The Irish fare is top shelf and the bar tenders actually know how to pour the perfect Guinness and if you have ever had Guinness poured incorrectly you know what I am talking about. And the music…oh my God the music is phenomenal!!! I just saw Black 47 there and they rocked that quaint little stage after a group of bagpipers got everyone totally pumped up and ready for a great night of Irish rock. Larry Kirwin was so close it was like he was playing in my living room. He sat at the bar after for a drink and he was just a regular lad. They have everything from Grateful Dead tribute music to traditional Irish music and everything in between. And if you think I’m done I’m not because they are not just the place to go for a perfect pint, great Irish food, and the most intimate music venue on the Jersey Shore…they are actually promoting Irish culture too… they are doing this by not just promoting traditional Irish music sessions but by being supporters of a great local Irish organization called Claddah na nGael (“Irish Shore” in Irish-Gaelic). 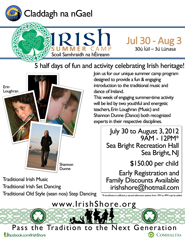 This organization promotes Irish language, Irish dance, and Irish traditional music. My kids just did the summer camp with “Irish Shore” and are now interested in their family history, Irish dance and traditional Irish instuments. If you’re an Irish parent you know how much this warms my heart and brightens my soul. We are now taking Irish lessons as a family at St. Mary’s in Middletown through Claddah na nGael “Irish Shore” and go to Molly’s every chance we get….Go raibh maith agat Maguire family!!!!!!!!! -Paddy Keeley and the whole Keeley family.